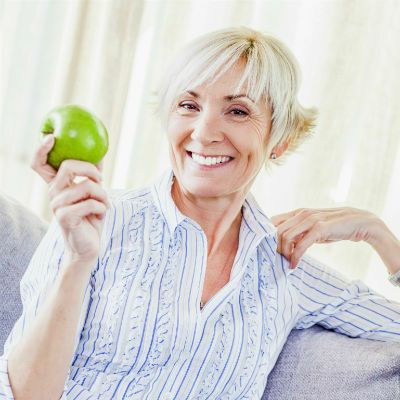 The thought of dental implants might not make you smile, but in the long run, they might improve it. People today live longer and lead more active lifestyles. Sometimes, your teeth can’t keep up. Even with regular brushing, flossing and checkups, your teeth might need some help. If you have lost any teeth, dental implants can improve your oral health and smile. 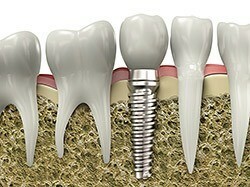 An implant is a post-shaped artificial tooth root surgically placed into the jawbone. The “root," is usually made of titanium, which is the same metal used for hip and knee replacements. The metal root works best when paired with human bone. There are two replacement tooth options: Attached or Removable. The attached replacement tooth has a more natural look and stable feel. The ideal candidate for implants is a non-smoker with good oral health. Additionally, the individual must have enough bone in the jaw and free of gum disease. For more information about dental implants, please contact our Sun City West, AZ practice. We will gladly help schedule a consultation with Dr. Harmon. We are here to help you achieve the bright smile you want. Why choose implants? Simply put, implants can improve your smile. If you are missing a single tooth, one implant and replacement tooth can correct your smile. Are you missing a row of teeth? 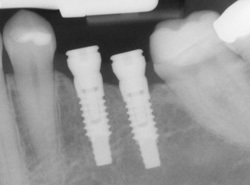 We can place a few implants to support a permanent bridge (a set of replacement teeth). Even if you have lost all your teeth, a full bridge or full denture can make your smile look new again. After treatment, your replacement teeth must be treated as if they were natural teeth. The better you care for your new smile, the longer it will last. Sinus Lift Augmentation: If you lose your upper back teeth, your sinuses might become enlarged. This often prevents dental implants in the upper back areas of your mouth; however, a sinus lift augmentation/graft might help. During this procedure, we can surgically repair the sinus positioning and replace any bone loss due to enlargement. After the procedure, a patient must wait for nine to 12 month before completing a dental implant procedure. Autogenous Bone Grafting: When attempting to place a dental implant, your mouth might not have sufficient bone quantity in the area where the implant will be placed. To complete the procedure, it might be necessary to take bone from other areas of your mouth and graft the bone into the deficient area. The most frequent locations from which bone is borrowed are the chin or the back of the jaw where your wisdom teeth were located. Implant Site Development: When a tooth is infected and removed, bone from around the infected tooth is commonly lost. If this occurs, various bone grafting procedures might be done when the tooth is removed to facilitate further procedures in the future. Computer Enhanced Treatment Planning: Our computers are equipped with unique software that shows CT scans three-dimensionally, which allows our staff to provide a better assessment. With this technology, we will better understand your mouth’s bone quality, bone quantity and bone location for optimal implant placement. With this information, we can offer the best results for your dental implants. Implant Maintenance: Just like your natural teeth, your implants must be maintained if they are to remain healthy. Daily cleaning, including brushing and flossing, is necessary, but just like your natural teeth, it is important to visit your dentist for cleanings. Speak with your dentist to decide how frequently you should visit for cleanings and professional maintenance.